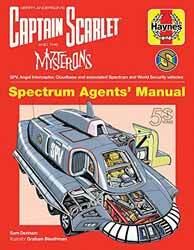 It’s the 50th anniversary of Captain Scarlet and to mark the event Haynes has produced the Spectrum Agents' Manual. It’s much the same as the Haynes Thunderbirds Agents' Technical Manual – the same author/illustrator team – and the result is therefore all rather jolly. We get cutaway diagrams of the Spectrum vehicles [Cloud Base, Angel Interceptor, SPV etc] as well as guest craft [including the Magnacopter, Wombat and Unitron Tank]. We also get to look inside Lunarville 7 and unexpectedly Zero-X, too. So far, so good… you have to love the detail and care taken over the artwork. Hats off to Graham Bleathman. What makes this book that little bit special is the introduction by Colonel White [suitable stirring] and the following chapter entitled “This is 2068”. This is an imagined snapshot of the future that ties in with events from the programme. It’s all very serious, as you’d expect, and as a result there are echoes of TV21, the world's best ever comic/newspaper. And now to nit-pick. Given that the readership for this fab book will be people ‘of a certain age’ – and fans of the show – do we really need another episode guide? Yes, I sort of know why it’s here but is it really necessary? And the layout of the guide is frankly a bit naff. It feels stuck on and out of place. That minor quibble aside this is a very enjoyable, if slightly silly, look at the imagined technology that will make 2068 tick. My only real disappointment is that I won’t live long enough to see the launch of Cloud Base. S.I.G. PS: I was a Spectrum Shade so I’d already seen the classified information in the Haynes Manual… 50 years ago!